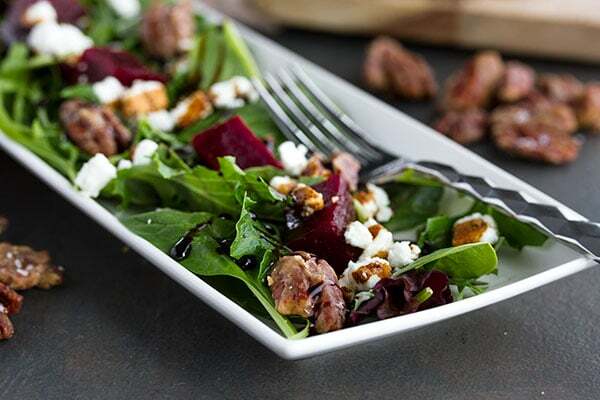 This pickled beet salad recipe with goat cheese salad recipe is simple and addictive! 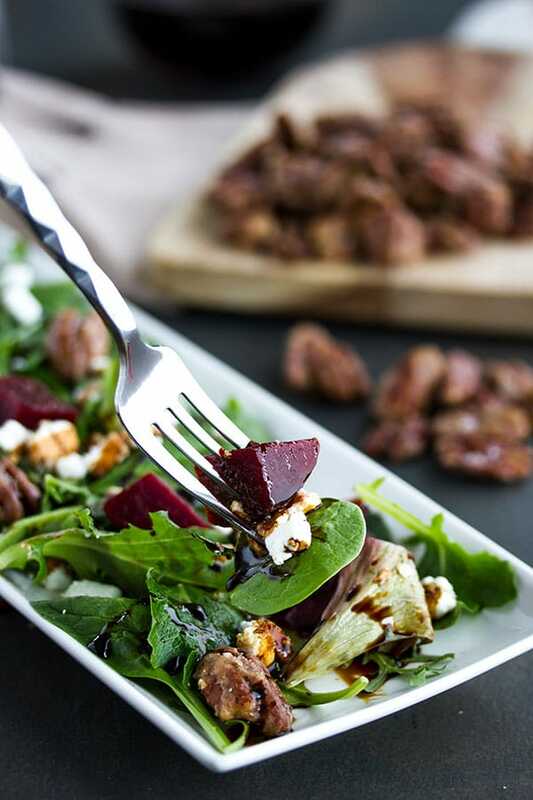 With greens, pickled beets, goat cheese, homemade maple pecans and a simple balsamic dressing, you will seriously impress your family and friends with this beet salad’s delicious and unique flavor and good looks. Every second fall for the last few years, Debbie and I have made amazing pickled beets. Not to brag or anything, but they are the best I have tasted. But then… What the heck do you do with 20 jars of pickled beets?! Besides just eating them straight from the jar, this pickled beet salad recipe is one of our favorite ways to eat them! What goes in a pickled beet salad recipe? This is the way we eat our pickled beet and goat cheese salad, but you could also change it up a bit if you have slightly different ingredients in your fridge. greens: any kind of mixed greens or lettuce works here. 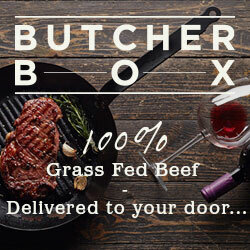 Spinach, kale, green leaf lettuce or butter lettuce. You could use romaine, but in our opinion, its not the best in this salad. cheese: you don’t need to use chévre goat cheese in this or any beet salad, but its the best. You could make this beet salad recipe with feta or any other type of goat cheese, but it really should be something sorta soft and crumbly. 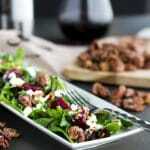 nuts: almost every beet salad you see has some sort of nut in in it, usually walnuts or pecans. We like pecans and especially maple roasted pecans. They are so dang good and we highly recommend using them in this beet salad. beets! : you need pickled beets for a pickled beet salad, however, you could also use roasted beets or even just steamed beets for this salad too. But the pickled beets are amazing in this salad. dressing: our dressing for this beet salad so simple. Olive oil and vinegar and a couple spoons of the pickled beet juice. Then salt and pepper. That’s it. Super easy. what else could you add: grated carrots, edemame, herbs like thyme, basil or dill, anything else you would want to add? We usually like to keep this salad pretty simple, but it’s always up to whoever is making it! Can you eat raw beets in a salad? You could. And I have seen lots of raw beet salads, but we tend to not eat raw beets. If you want to, I would grate them so they are small. Then they might be sweet and crunchy. If they are too big, they might be hard to eat cuz they can be quite hard. I prefer beets to be pickled, roasted, or steamed. In salads or otherwise. There are a couple ways. You can make them yourself like Debbie and I usually do. It’s fun and easy to do. Here is a good recipe for that. You can also make quick pickled beets! Just pickle them as you cook them. I haven’t tried this, but in theory it sounds good if you don’t have a jar of pickled beets on hand. Here is a recipe for that. Or… you can just buy them 🙂 However, I have yet to taste a store bought pickled beet that can hold a candle to homemade. But, here is a link to some pickled beets that look pretty good. 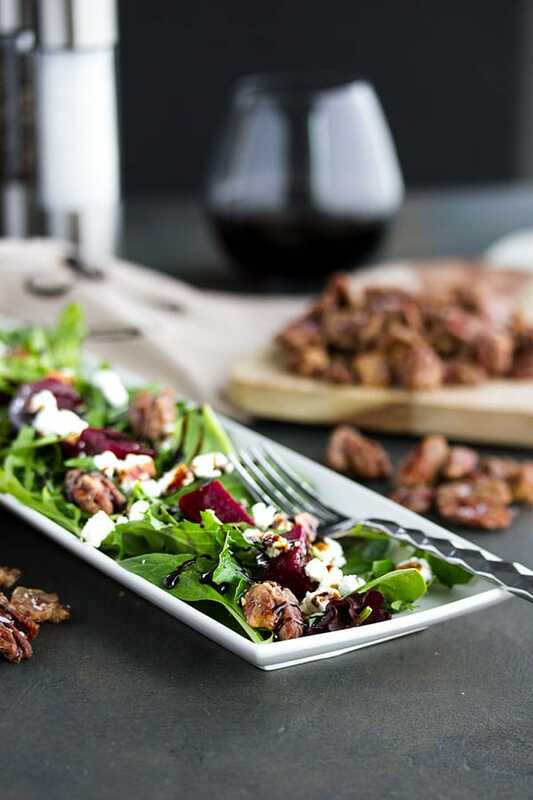 When to serve this pickled beet and goat cheese salad? We love this pickled beet salad recipe for entertaining because its beautiful, its unique, and it only take a few mins to throw together. And the dressing is as simple as drizzling olive oil and balsamic vinegar over top of the salad and finishing with salt. Seriously, that’s it! The juices from the pickled beets mingle with the olive oil and balsamic vinegar and helps to dress the greens in a tangy sweet dressing. Honestly, its soooooo good! Serve this beet salad as small individual starter salads to be a little more fancy, or make a big salad and serve it family style as part of the main meal. Your girlfriends will especially love it, but I’ve even given a plate of this salad to my husband for dinner and he gobbled it up. We always get rave reviews! That said, I often make this salad just for myself as a quick dinner when I’m home alone. pan fried halibut – we love pan fried fish, its so easy! potatoes with dill and garlic – so good! salad and sangria always go good together, especially when entertaining! Try one of these Sangria’s with your meal. This pickled beet salad is simple and addictive! 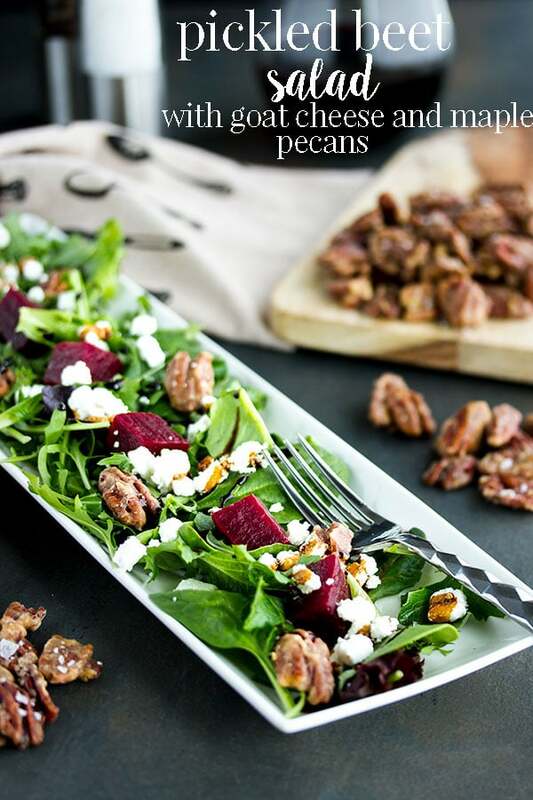 With greens, pickled beets, goat cheese and homemade maple pecans, you will seriously impress guests with this salad's unique flavor and good looks. Arrange your lettuce, mixed greens and/or kale on two plates. Place half of each of the rest of the ingredients around your plate on top of the greens. The beets, chévre goat cheese, and pecans. Sprinkle 1 tbsp of the dill on top. Use the remaining ingredients to dress the salad. 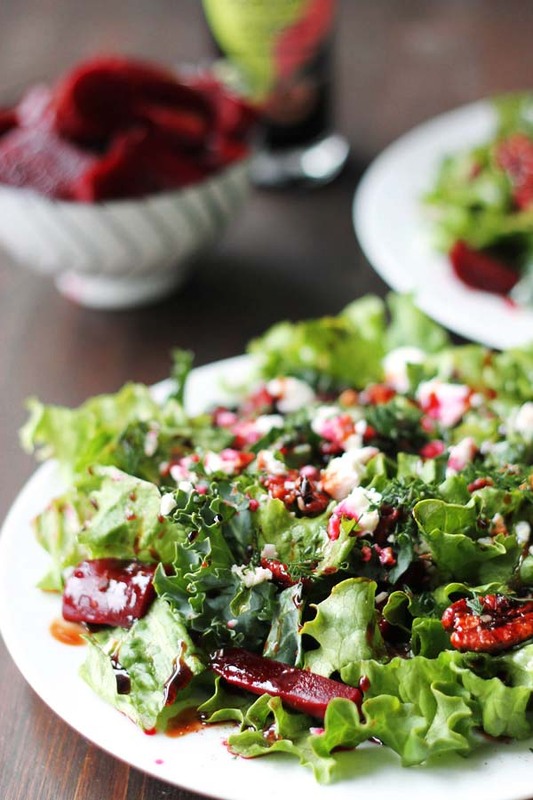 Drizzle the olive oil, balsamic reduction, and pickled beet juice over the salad. Sprinkle with salt and pepper how you like it and serve. Hello, salad looks amazing. Did you post your recipe for pickled beets? I’m interested in your recipe. Hi Melanie, no we haven’t posted our pickled beet recipe yet. We will have to get on that! When we do, I will put up a link on this page to the recipe. It really is the best pickled beet recipe I’ve tried. Are your pickled beets sweet or sour? I plated this with some flank steak and it worked really well together. I really loved the pecans in this, great idea! Thanks for sharing! So glad you liked it. I LOVE the pecans too!